(2)"Personal prayer" includes Low Masses, or the presumably rapid NO equivalent, at which the community will already have received before breakfast (except the hebdom). Do we know if the community actually receives at the 9.30 Mass, or only the hebdom + ministers? There are aspects of the "aggiornamento" which no one would vehemently condemn, for Catholics in the world. Yet I am dumbfounded by the idea that monastics ought to pay any heed whatever to the times, since they are simply outside the world. Surely St. Anthony and his friends were even more comically juxtaposed to the conveniences and luxuries of Rome than any mere 19th century austerities would be to modernity? I would like to hear Father's analysis of "Vultum Dei Quaerere", which, while containing some good stuff, could still do more damage than AL, since the Holy Father has a power of direct coercion over religious communities which he does not over the rest. I think things may have started to go wrong with St. Pius X’s advocacy for frequent communion. Fasting from midnight would seem feasible if one was only receiving communion a few times a year on major feasts and after a good confession. But if one expects to communicate on a weekly or daily basis, the fast from midnight imposes quite a burden on the routine of a modern worker or family. I read recently that this helped in effect kill the sung high mass in North America - Catholics wanted early, quick low masses so they could eat before starting the day, therefore attendance at the parish high mass at 10 or 11 declined precipitously. The “low mass mentality” of North American Catholics was in part what led to the completely botched liturgical reform. This being said, the three hour fast does seem like the logical compromise and perhaps traditional Catholics should try to adopt it (if not the fast from midnight) as their personal discipline. Most churches I know seem to have daily Mass starting mid morning, 10.00am or later. This also discourages longer fasts before receiving. Did the relaxing of the Communion Fast display an overly optimistic view of human nature on the part of these two popes? Old school Trads keep the midnight rule even when it means assisting at the Real Mass at 2:00pm. On the other hand, one is not shocked to see the pastor walking through the church greeting parishioners just prior to the Lil' Licit Liturgy while drinking a cuppa. In my experience, fellow adherents of the latin mass do tend to at least try to keep the eucharistic fast from midnight. 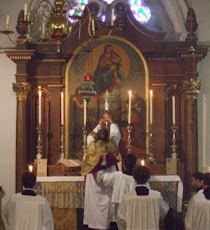 In may places, however, where a latin mass is celebrated at all, it is often slotted in after a full morning novus ordo schedule. I am sympathetic to any who say they would have a difficult time avoiding any food at all for half the day on a Sunday. You might say that those attending should abstain from communion altogether, but of course they aren't required to do so and it seems to me this is one of those situations allowing for prudential judgment in view of extraordinary circumstances. However among the Catholics I know who attend the Novus Ordo, even those who are very devout seem to make no effort to adopt the traditional eucharistic fast. This doesn't surprise me, considering of the extent to which the disciplines of fasting and abstinence have been totally pushed aside by the modern church. It is just not part of the experience of most post-conciliar Catholics. However, the mindset which leads one to adopt the lengthier eucharistic fast out of reverence for that tradition, is probably just as likely or more so to realize the advantages of participating in the traditional liturgy is well. This is one of those significant gulfs between traditional and contemporary practice that often leaves me with the impression that my family truly are observing a different rite than several of our friends. Of course, with the eucharistic fast being private by its very nature, it is not something that our Novus Ordo friends would even realize we are doing even if they were inclined to consider it. I was gratified recently, to see posted on the New Liturgical Movement website, a schedule of the Holy Week liturgies of Westminster Cathedral in 1939. Of the two masses celebrated, the High Mass was done first with the low mass of that Sunday much later in the day. I can't say if this was typical for those days but it makes a great deal of sense, since it permits the greater part of Catholics to experience the full splendour of the solemn mass while also observing the fast from midnight before receiving communion (and yes, I am aware that many did not frequently receive). In any parish I have ever attended where there is a more "solemn" mass, it tends to be later, sometimes after two or even three earlier and more perfunctory services. Oddly enough, Father, the Evangelical theological college across the road from my own (supposedly Anglo-Catholic) college has a weekly Eucharist in contemporary idiom known as "Wine Before Breakfast." How times have changed! At Trinity, we had, in living memory, a schedule very similar to that of Staggers (Mattins, Mass, meditation, breakfast). Now our weekly "Community Eucharist" is held in the evening, a necessity when most students no longer live in residence but are part-time commuters. For my part, as the parent of young children who need to be got to school in the mornings, I am grateful for the existence of midday masses. And I am also grateful that my daily journeys to and from work on the subway are just long enough to pray Mattins and Evensong. Life in the modern secular polis indeed! I am happy to be hot and bothered on you behalf, because this represents a deep shift in our understanding of the Mass, and of our sacramental discipline. Your suggestion some time ago that a fast from midnight should be observed (voluntarily) for Masses before midday, and for evening Masses one may follows the current 1-hour rule, strikes me as admirably sensible, and I chose to follow it. I know other, younger, people who do too. It is very annoying when at large traditional gatherings (like the Chartres Pilgrimage) the Mass comes in the middle of the day, with the Paul VI fast timed with a stop-watch, whereas it is possible (and used to happen) to have the Mass in camp first thing in the day. I don't often feel jealous of Muslims, but when I hear the young shop assistants in my local supermarket here in London cheerfully discussing their frequent fasts, I want to join in and talk about it. One cannot, of course as they would (rightly) despise our decadence. It's definitely not part of the general Catholic consciousness anymore. My parents always rushed us through breakfast on the way out the door to Mass. These days, I make it a point not to eat breakfast before Mass, at least on Sundays. I appreciate that our parish has Mass at a reasonable hour in the morning. A suggestion to push the TLM to later in the day was discouraged by the report that many of the people who come do observe the pre-Pian fast. I suppose that might be true. During the week I sometimes assist at a noon Mass in my town's downtown (aside: do the English use that term for a city's central business district?) church. The Mass is decently attended by local office workers. I try to keep the three-hour fast if going there, or when assisting at a Holy Day Mass in the evening. But that's just me. Father is correct that there is no general consciousness among Catholics of any preference for any fast other than "stop eating when you get in the car to drive to Mass." I'll just add this to the list of "things that show that we are not serious about bringing the East back into communion." My parents ( and I , occasionally, ) attended weekday Mass at 7.15 at a local convent and 8 o.c. Mass at the parish ch on Sunday. Even in Lent it is hard to find an early Mass nowadays and weekday Mass is designed for pensioners. A lot of this is for "pastoral reasons" which is often obfuscation for " the convenience of the pastor"
I always fast from midnight. My view is that, aside from the question of whether any food I might have eaten in the morning would have been sufficiently digested, if it doesn't feel like a fast, it isn't much of a fast. Fasting from midnight is standard with the Orthodox; there is no hardship as "the Savage" states. It's ancient and it's simply what is done. Huh. It just hit me that I fast from at least midnight nearly every day. In fact, from about 9 pm. But that's because I sleep better if I don't eat too much before bed. In the morning, there is no eating before Mass, usually at 8:15 am, or else 7:30 am, which is the first Mass on Sunday here. What was not done (at least in the West, I am not sure of the Eastern practice) was taking communion at almost every Mass. In medieval Christendom (read the Stripping of the Altars), devout souls attended Mass to observe the moment of consecration and elevation. Communion was usually an annual affair. In later times, devout souls received more frequently - but the communion rite was outside of Mass, usually before or after. (Read the Story of a Soul to see how Saint Therese received only every month or so on the advice of her spiritual director.) But now with the communion rite as part of Mass and an expectation of frequent communion, the midnight fast becomes less practical - especially if one wants to attend a sung high mass at 10:30 am with children in tow. So yes, the fast from midnight is traditional practice, but frequent communion is not. We generally call it the 'city centre'. "... so that they begin with Laudes, the service which should be the first..."
Since the Office of Readings is the descendant of the Matins, then it is quite appropriate that it comes first. The Lauds may be added immediately after or with an interval. Titus - from my London suburb, I 'go up to Town'. Petula Clark recorded a song called 'Downtown' in the sixties, but I have never heard anyone using the expression here. 1) Unless designed to prevent eating in church, a fast of one hour before the time of Communion is no fast at all (at a solemn Mass Communion might be over an hour from the start of Mass!). Better that the fasting rules' timings are governed by the time of the start of Mass, except for Holy Communion outside Mass. 2) The three hour rule was simple and easy to understand. for Mass in the evening, omit dinner/supper or have after Mass. Obviously no snacks/sweets/alcohol etc in fasting time. 4) Or simply restore the three hour fast. I personally don't fast when I'm asleep, only when I wake up. When I was Anglican, I fasted from midnight, or from lunchtime for a festal mass. Now I am Orthodox, my priest has instructed me to eat a light breakfast before Divine Liturgy, on account of reasons of health, and a longish drive to church. I reluctantly comply , as to disobey would be spiritual pride. He, and most of the faithful, observe a total fast from midnight , including fasting from water, even cleaning of teeth . The solution that seems best to me is simply to avoid receiving Communion if one has not been able to fast from midnight. There is no obligation to receive more than once a year, and frequent communion does not mean automatic communion. If it is a hardship to go without food all day before an afternoon or evening Mass, why not assist at Mass but make a spiritual rather than sacramental communion? There may be serious occasions when one is sorely in need of the Eucharist but has not fasted since midnight. In such cases, it is probably best to receive, as long as one has met at least the one-hour minimum. But generally, the choice is easy: fast or don’t communicate.